The man staggered and fell face-first on the ground. His injuries were too severe. The continuous attacks by Su Yi had dealt him great damage. He felt something cold placed on his neck. A large blade was held against his skin, making his hair stand on their ends as a chilling feeling of fear crept into the very depths of his soul. “How many of you are there? What are their cultivation levels and who is the strongest?” Su Yi appeared holding a large saber against the man’s neck as he asked casually. “Punk, what are you trying to do?! If you dare kill me, my entire party will not let you off, you will never be able to escape!” The man was terrified. He never imagined that his second encounter with Su Yi would result in such an outcome. Before the man even finished his words, Su Yi swung his saber and blood scattered across the air. With his one swing, Su Yi had sliced off the man’s left arm cleanly making blood gush out like a fountain. The man cried out in pain. He writhed around in agony as numerous beads of cold sweat dotted his forehead. “I will only ask this question one more time, how many of you are there? What are their cultivation levels? And who is the strongest?” Su Yi asked coldly, it was important to know your enemies. “There are over 60 of us. 20 of us are Yuan Xuan Realm cultivators. The leader is Yuan Spirit Realm First Grade and the vice-leader is almost breaking through to the Yuan Spirit Realm as well. If you kill me, our entire party will not let you go! If you let me go, I may be able to persuade the leader to forget about this entire matter, how’s that?” The man was completely terrified, his body struggling to create a distance between him and the youth. He never thought that one day, despite being a Yuan Xuan Realm cultivator, he would end up in such a pathetic state in the hands of a Yuan Soul Realm brat. “I was considering if I should spare your life. 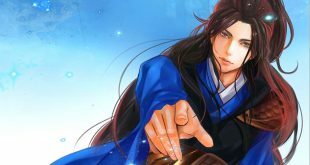 But it is such a pity, that I hate threats.” Chilling words came out of Su Yi’s mouth as he swung his saber once again. The blade plunged into the man’s chest. His desperate cries stopped, and his eyes bulged out. The last thing he saw in this world was the youth who stood there like the God of Death. Only at that moment did he understand, the youth was far more difficult to deal with than they had ever imagined. Su Yi searched the man’s body. Other than a few bits of medicinal herbs, Su Yi found nothing else. The man did not have an interspatial bag as well. Without any further delay, Su Yi immediately left the scene. The man had just launched a signal flare and soon there would be others from the adventurer party arriving, it was not a place where Su Yi could stay for much longer. Judging from the information that Su Yi had just gotten from the man, he could not afford to be careless. The strongest in the party was a Yuan Spirit Realm First Grade cultivator. It was an existence which he could not fight against, for now. There were also another 20 Yuan Xuan Realm cultivators. Most likely there would be Yuan Xuan Realm Seventh Grade and Eighth Grade cultivators. Su Yi knew that he would be unable to fight against them as well. But Su Yi was not afraid. After all, he had a trump card in his hand. Bi Ling and Yiyun had joined the battle. Five youths against seven adventurers. But the result was already decided from the start. Out of the seven adventurers, there were only two Yuan Xuan Realm cultivators and they were only First Grade. Guoyan and the rest were far stronger than them, whether it be martial art techniques or cultivation techniques. Soon, the seven men were killed. Guoyan and Zhouda had blood on their clothes, their hair tousled and they looked slightly pathetic. The seven adventurers may not be high in cultivation level, but every one of them was a bloodthirsty beast. In terms of actual combat, they were far more experienced and had given the five youths some trouble. Guoyan and Zhouda had gotten the short end of the stick and were furious. The kid could not have gone very far, they could not let him escape. At the moment, the five youths surrounding a corpse were utterly confused. “From the looks of the injury, it should be the work of that kid. Strange…” Bi Ling spoke, her beautiful eyes gleaming. Suddenly, there was movement all around them. In a few seconds, nine figures jumped out. Fierce auras exploded from their bodies. Among the nine adventurers, the face of a middle-aged man darkened with anger. He looked and observed Guoyan, Zhouda and the rest of the kids. “Humph! They are but a flock of crows banding together, let’s just kill them all.” Zhouda looked at the nine people and was not at all worried. “What an arrogant brat! But, those two ladies are not too shabby.” A man spoke, his eyes hooked onto the bodies of Bi Ling and Yiyun, not bothering to hide his lustful eyes. The men laughed and they were very motivated. Their vulgar eyes licking Bi Ling and Yiyun’s bodies. They had ventured out for so long and recently, had even suffered from a lot of hardship to find that brat. They had been holding themselves back for so long. Now that they had seen these few ladies, how could they resist any longer? They wanted to just pounce on them so badly. Within the Forest of Demons, sometimes, not even major sects or factions mattered. Seeing those lustful gazes and hearing the disgusting conversation, Bi Ling and Yiyun were not happy. Within their eyes, a cold light gradually appeared. Hearing those words, Qingfeng could not hold himself back any longer. How could he stand someone teasing his Junior Sister Bi Ling like this? He clutched his sword and formed a sword-thrusting gesture. Yuan Qi spiraled under his feet as he lunged towards the men. Guoyan and Zhouda followed, bursting with Yuan Qi holding nothing back. “These few kids are a bit troublesome. Be more careful and just leave the two ladies alive.” The face of the leading man fell. Once the youths started their attack, he knew that they were not weak, he did not dare let his guard down. While the two sides clashed, Su Yi was resting in a safe place, instructing the Fire Bird and Snow Ape to protect him from within the shadows. He sat down and started to meditate to recover his Yuan Qi. Continuously using the “Three Sabers of the Raging Dragon” and “Wrath of the Eight Wastelands” had expended too much of his energy. He did not let Flaming Beast Eagle and the Snow Jade Ape help him. Su Yi wanted to see how much he had improved over the past period of time while he was training. He was quite satisfied with the result. After around six hours, Su Yi was woken up by the Snow Jade Ape. Su Yi stopped meditating. His previously pale face had already regained much of its rosy color. Within the range of towering mountains, there was a small pass. Three young males and two ladies were currently walking within the pass, their auras were weak and their faces grim as they kept on turning their heads to look behind them. “It’s them.” At the peak of a mountain, in the mouth of a cave, Su Yi looked at the five figures below, his eyebrows slightly raised. He never expected to see those five people again.